If you have been struggling to sell SEO services to the clients, even when your methodologies are highly effective and result-driven, then you’re not alone. The truth is selling SEO services is not an easy task and it certainly isn’t everyone’s cup of tea. You need to understand what your clients expect from an SEO service provider, like you, and then pitch them accordingly. Even though good SEO automatically sells itself, there’s nothing wrong with putting in the required efforts to mark a good first impression in front of the client. 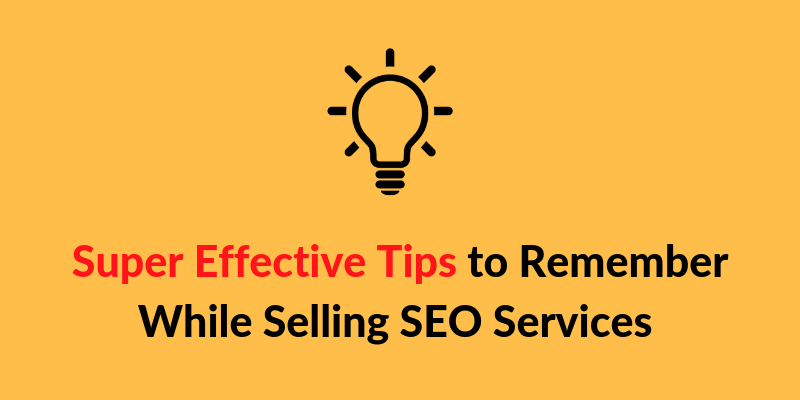 So, in this blog post, we have compiled a list of tips, which will help you to sell SEO services to your potential clients. Note: It is worth noting that the following tactics are completely organic and does not involve any paid marketing to reach potential clients. These tips will help you build strategies to convince a client who has already landed on your website through the search engine. Even though clients don’t need to know the entire SEO process, they should be familiar with what SEO actually is and how you’re going to achieve the desired results using SEO. Clients are more likely to pay for the services when they know what strategies you’ll be implementing for the entire month/week. No one’s going to hand over their money without knowing what they’re actually paying for. Educating the clients regarding the benefits of SEO is extremely important. Furthermore, when you put in the efforts to explain the benefits of SEO to your clients, you move one step closer to nurturing a healthy relationship with them. Speaking of customer relationships, being transparent with your customers and involve them in the entire process is always beneficial for both the clients and the service provider himself. In case you aren’t keeping things transparent, you are certainly not using the right SEO tactics to improve website performance. Even though most of the clients you’ll work for are likely to have very little or zero technical knowledge, there are clients who are going to check the status of every single link that you build for their website. In such instances, any unethical approach will damage your reputation in the market. So, regardless of the customers, it is always a good practice to involve them in the entire process and always rely on ethical SEO strategies. Being an SEO service provider, there are a couple of factors that you need to be familiar with. You can’t educate a client if you are not familiar with these factors. So, check out the following list of important factors related to search engine optimization. One thing that you need to remember is the search engine’s job is to display the most accurate results for a specific user query. Even though several factors go into ranking a website, relevance is probably the major search engine ranking factor. If a website has relevant content to a user’s search query, it is likely to be positioned on the search engine result page (SERP). It also means that search results are not always the same for a specific query. In case a website isn’t ranking for a specific keyword, it doesn’t necessarily mean that it has been optimized using poor SEO tactics. You need to remember that Google considers different factors before displaying a web page such as the user’s location. So, if a website doesn’t appear in the search results, it can be due to the user’s current location. As an SEO, your main goal should be to bring organic traffic to your client’s website. While other tactics like paid marketing and social media promotion can be good to increase website traffic, nothing beats the benefits of organic traffic. If a user is landing upon a website through the search engine, he is more likely to stick around for long. To do so familiarize yourself on how search engines actually work. Google has designed a highly specific and in-depth guide, which you can read to understand how Google search works. If you have paid attention to a search engine result page (SERP), you must be familiar with its different elements. Google uses different types of formats to display results. Some of them include ads, local listings, news articles, image results. As an SEO, it is crucial to familiarize with these different elements to identify which search results suit your client’s business requirements the best. Here are some of the elements of search engine result page. 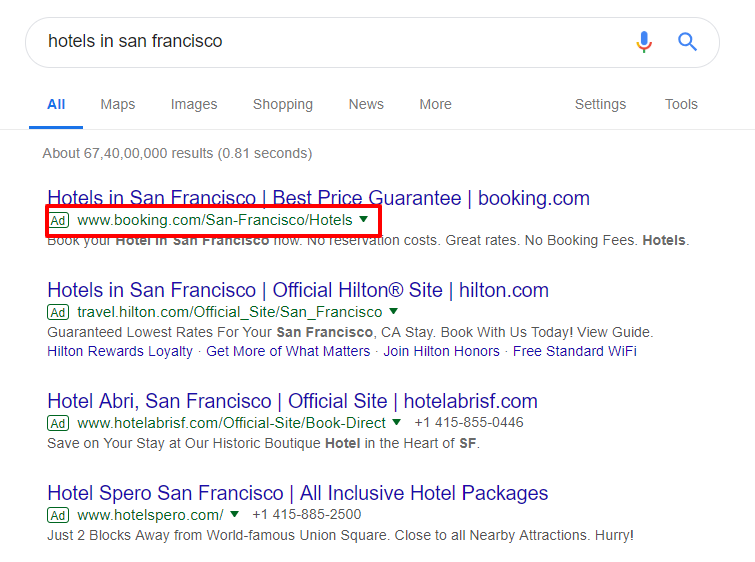 Paid advertisements are displayed at the top and bottom of the SERP. The advertisers pay certain charges to run these ads. 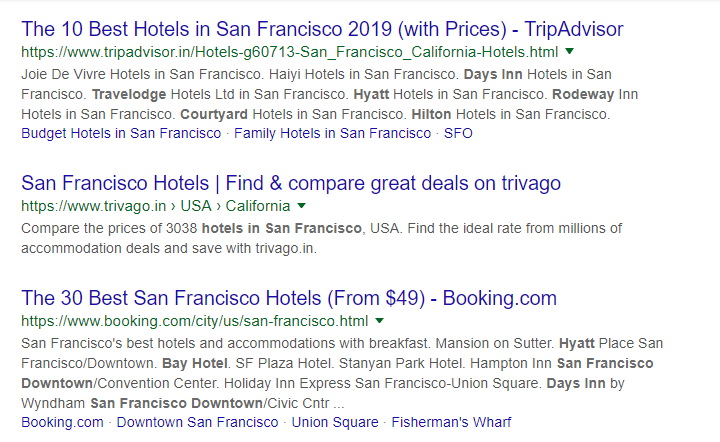 Like organic results, Google utilizes different factors to determine which ad should be displayed on the top. Since these are the first thing a user sees after performing a search query, they are more likely to be clicked. However, to run ad campaigns, you’ll need professionals who specialize in managing paid listings. Organics search results are displayed just below the paid ads. There are the results which are gathered by analyzing different websites and their content to display the most accurate search results. Most of the SEO practices are executed to organically rank a website. Map listings are location specific. In most cases, local businesses look forward to getting listed in Google Map results. 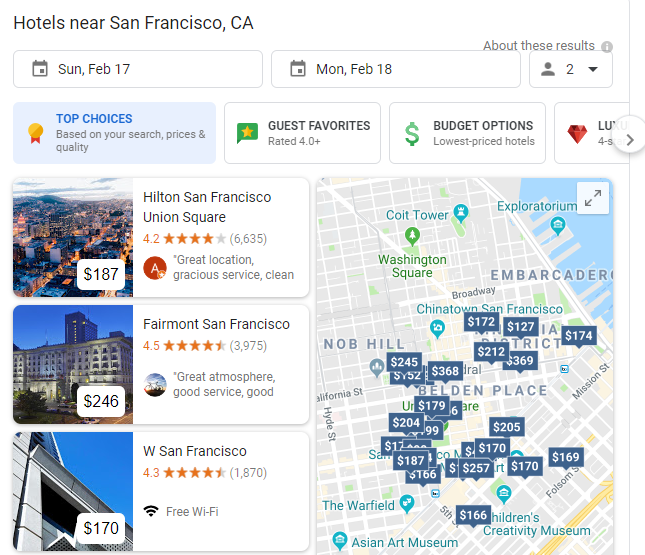 It also means that a user searching for a hotel in San Francisco won’t see the search results for hotels in New York in the map listings. While ranking a business in the local map rankings, Google considers a lot of things like customer reviews and how many citations, i.e., the number of times website name has appeared on other websites, the website has. If you have been doing SEO for a while now, you must know that it doesn’t deliver the desired results overnight. Even if you precisely utilize the most suitable strategies, it can take months for a website to get benefit from SEO. As an SEO service provider, it is your job to help the client understand the time and efforts that go into achieving results from an SEO campaign. As it always has been, high-quality content is the key to achieve better search engine rankings. Your SEO efforts will become more effective when the client’s website has search engine friendly high quality content. Good content comprises of two major things, information and a precise use of target keywords. It is important to know that the good old days of SEO, when you could achieve better rankings by stuffing your article with the keywords, are gone. Ever since Google has started to focus on understanding content in a better way, it has become imperative to wisely sprinkle the keywords in the content, while maintaining a natural flow throughout. If you remember the good old days SEO, backlinks had a huge impact on search engine rankings. The more backlinks a website has, better would be the search engine rankings. However, many people started to buy and sell links, which lead to Google changing its algorithm. Even though backlinks are still a major ranking factor, Google has become quite smarter in identifying a genuine link. It means that if you have manipulated backlinks, in any way, Google is most likely to penalize your client’s website. Google has compiled a set of guidelines, commonly known as Google Webmaster guidelines, which should be followed by every website to achieve better search engine rankings. If you follow these guidelines, you won’t have to worry about anything at all. However, in case your SEO practices don’t comply with these guidelines, Google is more likely to penalize the websites you’ll work on. Once a website has been penalized by Google, it can take weeks or even months before it completely recovers. It is also important that you familiarize a new client with any SEO done to their website in the past. Many clients who have hired unethical SEOs in the past end up sabotaging their website rankings completely. So, it is crucial that you tell the clients what damage has been done to their website and what steps you would take to recover it. It is important for every local business to have consistent NAP across the web. It means that the business name, Address, and Phone Number for the business should be same on every website, where is it has been listed. NAP is an integral part of local SEO, and the local SEO efforts become more effective when the website has a consistent NAP data. Furthermore, it can become quite strenuous to achieve better rankings in the Google Map listing if the business doesn’t have a presence in the city at all. Even though satellite offices can be helpful in such cases, they possess a threat to the overall business reputation and search engine rankings. The process of selling SEO services become much easier when you’re familiar with the latest search engine trends, and having a mobile-friendly website is one such trend. Since more than 50% of internet traffic comes from the mobile itself, it is imperative to have a mobile-friendly design for a website. Google has already implemented the mobile-first index, and if a website isn’t mobile-friendly it will witness a severe fall in the search engine rankings soo. So, notify your clients to ask their developers to optimize the website for mobile. Use Google’s Mobile Friendly Test to identify whether your website is optimized for mobile or not. Fast websites are more likely to achieve better rankings, mainly due to their low bounce rate. A user usually waits for 3-4 seconds for a website to completely load. In case a website takes longer than that, the user is likely to click the back button to find another website. This increases the bounce rate for the website, which eventually leads to poor search engine rankings. As we mentioned earlier, having high-quality content on the website is imperative to achieve better search engine rankings. Your client’s website needs to be stacked with quality content, which does not only helps the search engine but also captivated the target audience. We recommend having in-house writers to write quality content for your client’s website. In saying that it is also imperative to have a dedicated blog page on the website. Even though it isn’t one of the ranking factors, having a separate blog page will provide you with tons of content opportunities. However, if the website does have a blog page, make sure to consistently update it with new and informative blog posts. A good social media presence can lead to better search engine rankings. Today most of the website owners utilize social media to direct traffic to their website, and there’s a huge possibility that your client’s competitors are doing the same. So, make sure to ask the clients to have an active social media presence. You can also charge the clients to handle the entire social media activities on your own. These are some of the things that you need to know as an SEO. If anything, they’ll make it easy for you to sell SEO services to potential clients. How SEO Works for Different Websites? As an SEO service provider, you’re likely to stumble upon many projects having different requirements. In general, there are two different types of websites. Existing Websites Experiencing Fall in Rankings. For both the websites, you need to carry a different SEO approach that suits the website requirements the best. Let’s take a look at both the cases. These are the websites which have been live for many years and have suddenly experienced a severe downfall in their search engine rankings. Even though this could happen due to a variety of reasons, website customization is the most common reason that leads to lowered rankings. If you stumble across any of such projects, here’s what you need to do. Start with an in-depth website audit to identify the damaged elements of the website that needs to be fixed. Prepare a list of all such elements as it’ll make it quite easy for you to fix these things. Audit the website’s backlink profile as well and review all the backlinks pointing to the website. Look for bad links, low-quality links, broken links, and develop a strategy to fix them. Focus on acquiring new high-quality backlinks to the website. If the website lacks in having high-quality content, scrutinize the web to find relevant content for the website. This is point where you can use the Skyscraper technique to write quality content which attracts more backlinks. It’s always a good strategy to start with an in-depth website audit as it helps you understand the obstacles that you may face in the future. SEO audits vary from site to site and can take anywhere between 2-3 hours to a month, mainly depending on the website size. While selling SEO services, website audit should be charged separately from the monthly retainer fee. In most of the cases, the first few weeks will be utilized to perform the website audit and therefore you can set up a separate prize for the website audit. It’s always a good thing to start from the scratch, isn’t it? Clients who are familiar with the importance of SEO for a website usually avail SEO services during the development phase itself. In such cases, your job would be to provide the clients with SEO friendly design that’ll improve the overall website performance as well as search engine rankings. Working on a brand new website is way easier than working on an existing website as you don’t have to fix anything. All you have to do is build the most suitable strategies that suit the business requirements the best. There are a certain things that your clients should or never hear. It is important to differentiate the things that you should be open with clients and the things that are worth hiding. What You Should Tell Clients? SEO isn’t an overnight process. It takes time to achieve desired results from SEO. Bring up the website audit in the beginning and familiarize the client with the website issues that needs to be fixed immediately. Keep the clients informed about the tasks that you’re doing on a daily basis. It is always a good SEO practice to send weekly and monthly reports, of your tasks, to the clients. Client’s being transparent is as important as you being transparent with them. So, ask your clients to notify you about any changes they make to their websites. Never promise clients anything as it’ll backfire on you pretty soon. There shouldn’t be any specific promises, especially the one that involve achieving specific search engine rankings. You’re just here to do your job and you certainly have no control over search results. Let your efforts be shown in the results. But until then do not promise anything at all. Do not answer incorrectly to the client. If a client has asked a question, which you don’t know the answer to, do not tend to give wrong answers. Making things up is never good. Take your time and look up the web to find answer to the question. Rather than giving clients a quick review of their website, provide them with an in-depth website audit report. No one has any control over how search engine display search results. Therefore, it is quite difficult to sell SEO services. However, that doesn’t mean that it’s impossible to sell SEO services to potential clients. With right strategies, you can easily convince a client to avail SEO services or affordable seo services for small business and achieve significant results.